Looking for a new host for your next school tour? You’re in luck – we have a day of adventure waiting for you! 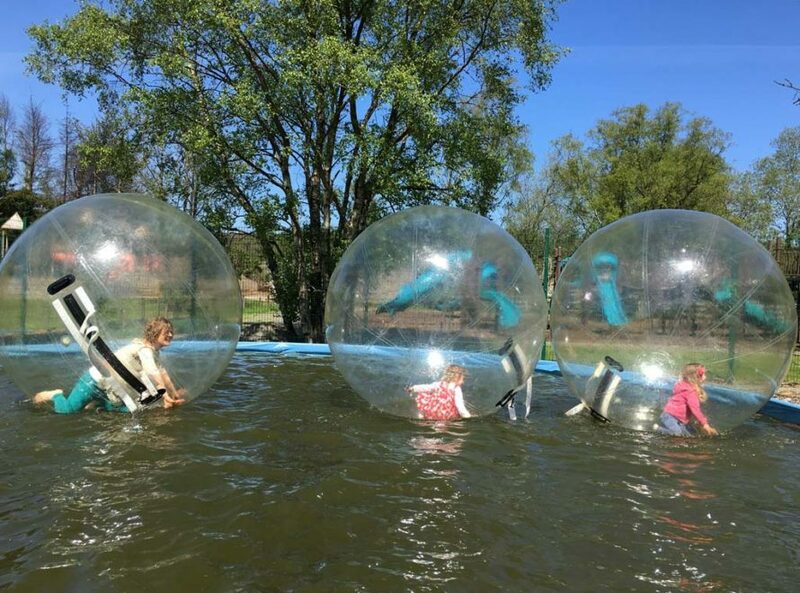 Ireland's Newest & Largest Aqua Park with over 30 obstacles for families to conquer! Book in for a day visit, or stay overnight camping or glamping. Hidden Valley Park is an extraordinary beautiful park offering self-catering, camping, activities such as kayaking, fishing, swimming, rowing boats, outdoor adventure park, walking, bumper boats, organised football, cinema nights, tours such as walking tours and cycling tours, events such as Barbeque Fun Day, Easter Eggstravaganza, Monster Mash, Paddlefest Ireland, themed dinner nights, and numerous attractions located in the nearby area. You will get it all in Hidden Valley Holiday Park at Rathdrum, County Wicklow, Ireland. The Fisherman’s Lodge has the same amenities as the log cabins. It is located beside all the other two-bedroom log cabins. In this unit, there is one bedroom rather than two bedrooms. In the one bedroom there is a double bed and out in the living area, there are two single fold out beds. This cabin holds up to four people or 2 adults and 3 small children. The Loft House Glamping Lodges and Loft House Ensuite Glamping Lodges overlook the Avonmore River on-site. These lodges can accommodate up to 6 people and provide a safe and comfortable alternative to camping! These lodges contain two double beds, two single beds, picnic table, small fridge, kettle, lights and heater. There is no kitchen in these lodges and only the Ensuite units have a toilet and sink. The amenity block is just a few feet away, which contains the toilets, showers, camper’s kitchen and laundry room. If you are renting a glamping lodge, then you must supply your own sleeping equipment such as pillows, sleeping bags, linens, duvets and towels. Pets are not allowed inside the glamping lodges. Smoking is also not permitted indoors. These lodges can be booked nightly all season long, except for bank holiday weekends. Hidden Valley is a serene haven of relaxation. Set in a beautiful valley with sites overlooking the tranquil waters of the Avonmore River and a glassy, private lake, we offer the opportunity to experience a holiday amid an abundance of wildlife including kingfishers, cranes, wild geese, ducks, otters and pheasant. We are easily accessible from Dublin, Dun Laoghaire and Rosslare ferry ports. The park offers both hard-standing and grass sites, each with electric, water and grey waste. We also have a tent only area with electric. The modern toilet and shower block is heated and tiled, and also includes a laundry room and camper’s kitchen overlooking the Avonmore river. Campfires near the river’s edge are possible and timber is sold from reception. There is no minimum stay for touring/camping, except for Bank Holiday weekends (3-night minimum). PLEASE NOTE: Hidden Valley is a quiet, respectable, family-run park. We cater for couples and families with children. We DO NOT cater for adult/teen groups, hens/stags or those who are looking to stay up at night past our strict family curfew. We have a strict noise curfew from 11 p.m. and we DO NOT tolerate any behaviour at any time that disturbs neighbouring families (including, but not limited to, foul language, rowdy behaviour etc.). If you book and you cannot follow the Park’s Rules, then you will be asked to leave with no refund. NO EXCEPTIONS! Kid's Outdoor Fun Park (two large playgrounds, lazy river, slides, football pitch, giant space net) - FREE - Day Visitor rates are €5 per person and visiting hours are from 10 a.m. to 4 p.m.
*Combat Laser Tag is the only activity that needs to be pre-booked. **Combo Bracelet - €10 for 4 turns (water balls, bungee trampolines, rock wall, vertical tunnel & slide). Savings of €4 to €6. Please Note: Not all activities are fully open in low season. Please call or email if you have any questions. Cafe on site open daily during July and August for hot food, cold drinks, sweets, ice cream and more! Have you thought about cycling the Sally Gap, but thought it might just be too difficult, well we have the solution for you – the cycle begins at the top of the Sally Gap! Included Gear: brand new Trek bicycles, new bicycle helmets, hi-viz jackets, lock and safety kit. The cycle begins with amazing views at the top of the Sally Gap. From here you will cycle mostly downhill back to Laragh. At Laragh you may decide to grab some lunch at Lynham’s, or maybe you would prefer to pack a picnic. After lunch you can visit Glendalough (the 2nd most visited site in Ireland), or you may decide to head back towards Rathdrum, stopping at the Wool factory on the way back. The beauty of the cycle is that you can take it at your own pace and visit only the sites you want to see. You can stop to take pictures and enjoy the scenery as you please. 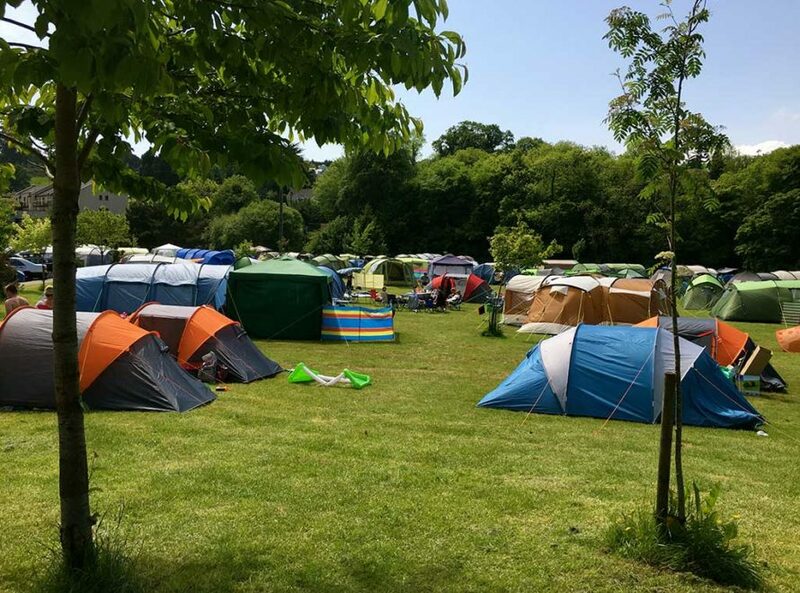 The cycle begins at 10.30 a.m. and you have until 8 p.m. to return to the campsite, so enjoy the day! The tour finishes right on our own beach! Some kayak experience is necessary. You must signup for the tour the day before. The journey lasts approximately 1.5 to 4 hours (you may want to stop halfway and lay on the beach) Each group will be briefed the night before. All gear is provided – kayak, paddle, helmet and life jackets. Single and double sit-on-top kayaks available – extremely safe. If you love the water, then you will love this tour! There’s nothing more relaxing then floating down the river listening to the birds sing while watching the fish jump out of the water. Full Day Bicycle Hire: € 20.00 (All gear is provided – helmets, safety kit, maps, hi-viz jackets). 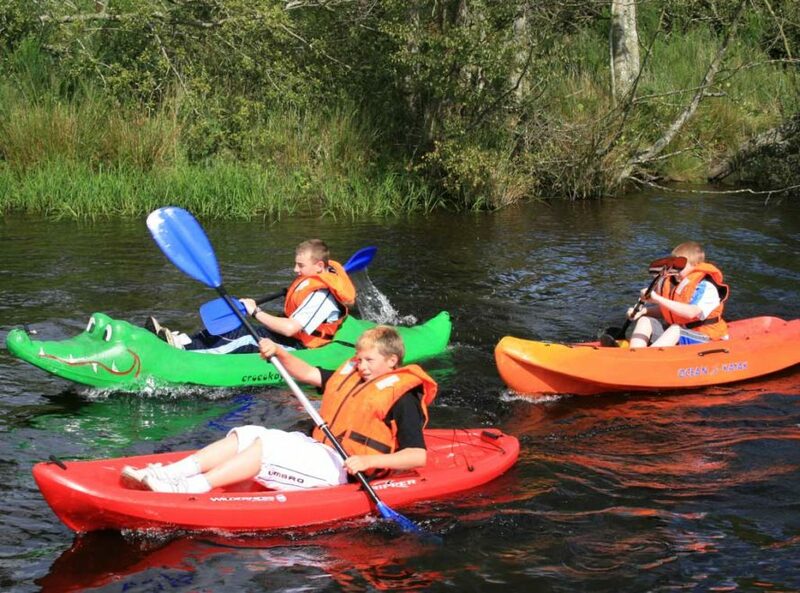 Kayak Day Hire: €30.00 (Hire includes kayak, paddles, life jackets and helmets). Looking for a new host for your next school tour? You’re in luck – we have a day of adventure waiting for you! We cater for both primary and secondary schools, and we have a wide range of activities to choose from. Our friendly and experienced team will offer a high a quality tour that the kids will be talking about for weeks. All activities are fun, challenging and exciting, and are great for developing working relationships, leadership, communication, teamwork and problem-solving. Half and full day tours available depending on your requirements and food packages available as well. We are easily accessible and have ample parking for school buses. Follow the N11 South to the R772 for Rathnew and Wicklow. At the roundabout in Rathnew, follow signs towards R752 for Rathdrum (approx 12 minutes from Rathnew). You will come around a bad bend into Rathdrum. The park is on your right, and is across the road from Glanbia. Turn right at the Ivy Leaf Apartments (before the road splits). This is the laneway alongside the river. This road will lead you into the park. Follow the N11 North to the R752 for Rathnew and Rathdrum. Follow all the roundabouts for Rathdrum. At the t-intersection, turn left onto the R752. It will take you approximately 12 minutes from here to get to the park. You will come around a bad bend into Rathdrum. The park is on your right, and is across the road from Glanbia. Turn right at the Ivy Leaf Apartments (before the road splits). This is the laneway alongside the river. This road will lead you into the park. This is another option, but the roads are not as smooth and the signs are not well posted! Take the N11 North to the Arklow South exit. This brings you into Arklow town. Turn left and follow the road down into town. When you get to the roundabout, go straight through it. This road turns into the R747. Take the R747 to the R752. You will pass the Woodenbridge Hotel, Avoca and then Meeting of the Waters. Keep going straight and you will come into Rathdrum. Follow the road down the hill. There will be a petrol station on your left. At the bottom of the hill, before you cross the river, turn left at the Ivy Leaf Apartments and Hidden Valley Park. We go camping here every year and looks like they're adding on more activities again for next year. Well worth a visit for families with kids. Spotless and noise curfew enforced which is great for our family. We've been going to Hidden Valley for a few years now and can't recommend enough for families with kids. The staff are so helpful, lots of activities, clean park and food on site too if you don't bring your own. We usually go camping, but they have lodges too that always seem to be booked out.